Wire arc additive manufacturing (WAAM), utilizing welding arc to melt metal wire into shaped parts, has become a promising manufacturing technology recently. Tandem GMAW–based WAAM (TG-WAAM), in which two wires are fed into the molten pool simultaneously, has the potential to double the efficiency of traditional WAAM. However, the high wire-feed speed is accompanied with high heat input that is likely to cause molten pool overflowing, especially at upper layers because of decreased heat dissipation and increased heat accumulation. An in-process active cooling technology based on thermoelectric cooling is introduced into TG-WAAM in this research. Its effect on forming quality and efficiency of TG-WAAM is investigated experimentally. The results show that the additional cooling well compensates for the excessive heat input into the molten pool, which enables not only increased maximum wire-feed speed (9–15%) but also reduced inter-layer dwell time (42–54%), while maintaining the desired forming quality. The overall efficiency is improved by more than 0.97 times in the case study. 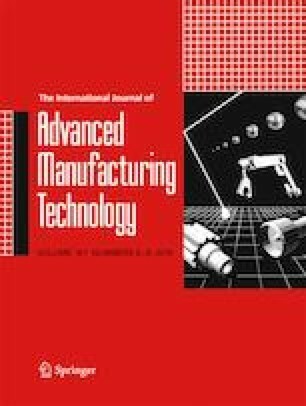 This research provides a feasible scheme to solve the conflict between forming quality and efficiency during WAAM. This work was supported by the National Natural Science Foundation of China (no. 51805013) and Foundation Research Fund of Beijing University of Technology (no. 001000546318526).